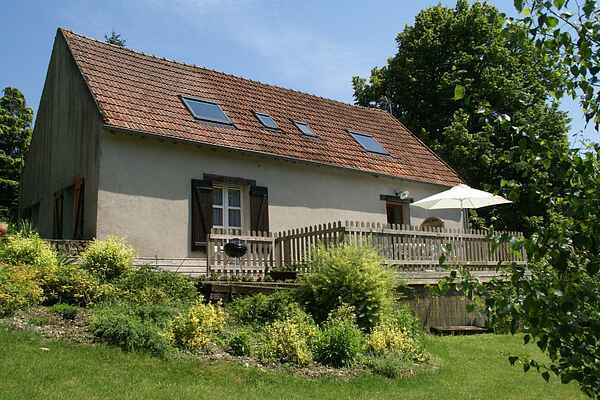 Situated in a fantastic, quiet area full of nature, this detached holiday home lies on the tourist route between Orleans and Blois. From an old farm to a wonderful holiday home on a huge 2-hectare terrain. Its tidy, rural interior is decorated with tools from its time as a farm. The charming tiles in the kitchen fit the style completely. The house has a comfortable patio (no neighbours in sight) with garden furniture, a barbecue and a huge garden with a swing where the children can release their energy. They'll be pleased to meet the donkeys Margot and Saxo. The kind owners also live on the grounds, but they will respect your privacy. There is a bakery and supermarket in Saint-Ay (2 km), fishing lake (2 km), forest (3 km). You'll stay close to the famous castles and banks of the Loire River, where you can go on lovely bicycle tours. Beaugency (6 km) is worth visiting with its medieval market square (market on Saturday mornings), beautiful historic buildings and covered swimming pool. The lively city of Orleans (14 km) has a beautiful old centre, shops and restaurants and the beautiful Sainte-Croix Cathedral. There's a 18-hole golf court called La Limère near Ardon (20 km).